I’m tired of letting myself fall for the lies of “Christian” Perfectionism. I’m tired of Christians who are so concerned about blotting out all sin (and all sinners) from the church that they exclude the very people who are desperately in need of a savior. When I see this, I’m almost tempted to ask myself why Jesus had to die in the first place if we were just going to eliminate all sin on our own and negate any need for a savior at all! I’m tired of people holding Christians to a standard of perfectionism that they can never hope to achieve and then writing off faith in God when his children ultimately fail to live up to their lofty expectations. It’s ridiculous! There must a thousand journalists with their hands on their keyboards anxiously waiting to catch Tim Tebow doing something unChristian so they can crucify him for it. Mainly though, I’m tired of trying to be perfect myself. I’m tired of failing at that and then after failing, trying desperately to cover up my failings before someone notices and calls me out on my imperfection. When did Christianity start being about us trying to outdo each other in Godliness? When did it stop being about grace, about mercy, about sinners falling on their knees at the foot of the cross and staring in awestruck wonder at the salvation they had no business deserving yet none the less received? I don’t know when it happened, but somewhere along the way, we as Christians started worshiping perfection and on the flip side destroying all who strove to achieve it and ultimately failed. Believe me, this is not something I can blame others for. I’ve fallen for the lie as hard as anyone ever has. The allure of being the perfect Christian. Of having other believers pat me on the back and talk about what a good moral example I am. Of this somehow meaning that I had to do everything right, because if I didn’t, if I were to fall, me with my upbringing, then what hope could there be for anyone else? For a long time, I’ve felt stuck. Stuck trying to pretend to be perfect to my Christian and secular friends alike and just hoping I could some how find the strength to keep it together and not wind up letting everybody down. 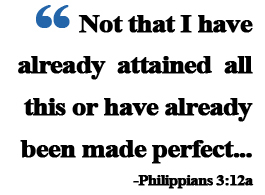 What’s worse, this pursuit of perfectionism never helped me grow in my faith and it never drew me closer to God. If anything, when inevitably, I did sin, I felt guilty and ashamed and did not want anything to do with God. I did not want him to see me like that, vulnerable, fallible, as a sinner. It’s very easy, as someone who has grown up in the church to fall into this trap. The rigging for this snare are all around us. We don’t want to let our parents or pastor down. We want to set a good example for our Christian friends. We want to show a lost world the “difference” that Christ has made in our lives. We want to somehow earn God’s love. I let myself get caught up in this pride of believing that I wasn’t as sinful as somebody else. And then of course, when I did sin, I was caught up in the pride of, at the very least, not letting everyone know that I was just as sinful as everybody else. I know at least with me, it often started from a very good place, from an honest desire to please God. I also know that the line often gets blurred. What one minute is pleasing God and seeking out good from a desire to grow closer to him, in the next minute, with the help of my sinful mind, turns to pride at my own accomplishments or self loathing at my utter failure. In fact, I’ve probably sinned more times trying to be perfect, than I ever have trying to you know…actually “sin”. I can’t even count the number of times that pursuing perfectionism has caused me to stumble. I remember as a kid lying multiple times to cover up things that often weren’t even sins! Instead, they were things that would not have painted me in the best of lights, so I lied. Speaking of lights, here’s a perfect example. When I was eight or nine in Azerbaijan, I broke a lamp. A lamp that belonged to our landlord at the time. It was not malicious. It was not intentional. It was not my first step on the road to becoming an international lamp breaking terrorist. I was just a rowdy, rambunctious kid and I broke it. If, at this point, I had simply told my parents, then that would have been the end of it, and I probably would not remember the event. My conscience would be clean. But I didn’t tell them. I was afraid they would be upset. Perhaps I’d get scolded for rough housing, or they would be disappointed in me; I would have let them down. So instead, I propped it up, taped it together and prayed that no one would ever find out what I’d done. No one ever did. I remained “perfect” in everybody’s eyes…everybody’s except my own…and God’s. I guess that’s my biggest problem with the cult of perfectionism and why I’m done with it. Ultimately, I’m not fooling the only individual who I tell myself I’m trying to be perfect for in the first place, God. Ultimately, I already have God’s approval, so why am I trying so damn hard to earn it? I’m not fooling myself either (and I have a sneaking suspicion I may in fact be the one whose approval I’m really trying to gain). So I’m done with it. I’m not going to strive to be perfect anymore. I’m okay with letting Christ be the perfect one for me and allowing myself to simply be a perfect sinner, saved by grace. I want to be broken and honest with God, to be intimate with him. I can’t do that if I’m always trying to earn his approval. If you’re like me, if you’ve been trying to achieve physical perfection, I hope you’ll join me in throwing off the heavy chain of perfectionism. You’ll never achieve a level of excellence you’ll be happy with this side of eternity with God anyway. The good news of course is that perfection has already been achieved on your behalf and there is nothing you had to do to earn it. God already sees you as perfect, right now, while you are still sinning, because he sees Jesus as perfect. That is a heck of a burden off my back. I was originally going to end this post with a lengthy and detailed confession of my sins, to get it all off my chest. It would have been rather scandalous, but I’m not really sure what it would have accomplished other than to once again draw the attention to my failings and how unperfect I am, thus making perfection the end goal (however unachievable). This would have completely defeated the point of this post. You see, I no longer care about trying to be perfect, because being perfect is no longer the focus. In fact, I care very little about it at all. Being perfect no longer owns me. Which means I no longer have to focus on not sinning. My sin has already been paid for, all of it, even what I haven’t done yet. Why would I keep on focusing on it? Instead, I’m free to focus on my relationship with my savior. A relationship that was severed by my sin. The very relationship that God wanted to have with me so much, that he was willing to die to regain. This relationship is freeing. Instead of a list of dos and don’ts that I could never hope to live up to, I’m freed from my constant guilt and able to simply explore God. To get to know him better. To experience the thrill of his unconditional love and to slowly allow myself to reciprocate it. This relationship, as it deepens, could very well mean that I have less of a taste for sin, but it hardly matters to me anymore, because being perfect is no longer a goal of mine, knowing my heavenly father better is. So goodbye perfectionism, I won’t miss you. I’m glad to end my pointless pursuit of you. I’d rather spend my time pursuing the one who already pursued after and caught me. 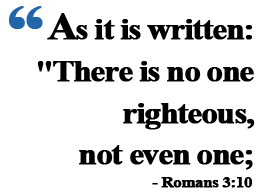 Footnote: If you are struggling with the pursuit of perfectionism, if you want to be free to pursue Christ instead of a list of rules, I highly recommend that you take the time to read through the book of Romans. Paul does an amazing job of laying out the gospel and the cleansing work of the cross in relations to the law and what the law was unable to accomplish. It will also explain how this relationship, freed from sin, is not a license to keep on sinning, but the freedom to finally pursue God instead of rules. I pray that as you read it, God will set you free from legalism and that you will be able to fully embrace the once and for all time sacrifice of Jesus Christ on the cross. Better to be righteous, saved, humble and forgiven. Great read. I enjoy your blogs Robert. Sadly, this is what drives me away from churches time and time again. Too many people who are focused on the absolutely nonsense of being perfect and out Godding people. This, among a few other reasons, is why I no longer attend any church. It has nothing to do with my relationship with God and everything to do with not caring to deal with the standard church culture. I hope you’re doing well, keep writing!
) I handle such info much. I used to be looking for this certain information for a long time.